Kent Relocation Services is proud to announce that we have been awarded the 2017 Australian Business Award (ABA) for Service Excellence. This is the sixth consecutive year that Kent has won this award. This highly regarded award is assessed by means of an objective and intricate framework, wherein eligible businesses are evaluated based on world-class performance standards. Kent scored exceptionally well across all measurable components of the award category, demonstrating leadership and innovation in the pursuit of service excellence. “Over the past few years, Kent Relocation Services has really transformed into a client-based organisation, leveraging all stakeholders to unlock value within the Kent team. Our corporate clients remain at the forefront of our decision-making, as we constantly seek to improve our processes, and make our clients’ businesses run more effectively. With corporate clients spread across all sectors, we competitively partner to navigate an ever-changing marketplace,” said Blythe. Kent Relocation Services implements unique cost-saving practices, as well as fundamental customer-service skills, particularly within our vertical service solutions. The impact of these solutions sees us creating tailor-made partnerships that exceed expectations, and improve agendas for each client. Domestic and international removals and secure storage services. Kent is proud to have earned countless domestic and international awards and industry accolades. 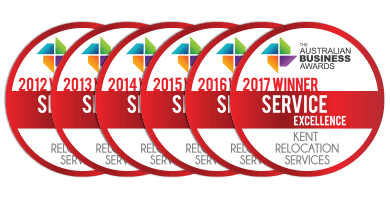 However, as appreciative as we are to have earned these awards, the validation of our success that matters most to us are the hundreds of contracts that we are awarded and renewed each year across most every industry sector in Australia and abroad. With an average contract length of over 10 years, and many over 25, it is this year-on-year ability and continued commitment to deliver successful outcomes for our partner clients that matters most.